It's a new year, and time to get moving! Although Americans know there are many health risks associated with a sedentary lifestyle we often feel overwhelmed with the mere thought of exercise, even though we know the benefits are plentiful. Not only is exercise good for your health but it is also good for your mind and overall sense of well being. So now is the perfect time to commit yourself to developing new personal fitness goals for the new millennium for a new you. Okay, so every year you tell yourself that this will be your year to get fit. Then, within three weeks into January you are back to your old pre-New Year's Resolution habits. One of the most popular excuses is lack of time. Who has time to go to the gym, work out, shower, change, and go home or to work? You should look at it from a different perspective. Who can afford not to? You need to make the time to take care of yourself since this will improve many of the other parts of your life. Here are some tips for making exercise a permanent part of your lifestyle in the new year. Good Luck! Get moving! Just do it! There is no time like the New Year, so why not get started now? Sit down and develop your plan of action and stick with it. You really do owe it to yourself and your family. Set goals, both short-term and long-term goals, and allow yourself rewards for meeting them. For example, you could set a short-term goal to exercise 3-4 times a week for 30 minutes of cardiovascular exercise and 30 minutes of strength training. Your long-term goal could be to lose weight or lower your cholesterol level. A sample reward could be that for every four weeks that you meet your goals you could get a massage, a new piece of clothing, a movie, or an evening without the kids. 3. Abandon an all-or-nothing attitude. Don't think of exercise with an all-or-nothing approach. If you don't get to exercise as planned, that's okay, just get back on track tomorrow. Set realistic exercise goals but understand that some weeks you will meet your goals and other weeks you won't. If you don't reach your goals do what you can. Just keep moving and you will feel much happier. You don't want to give up on your exercise program since it is such a great way to help relieve stress! It is very common for people to try to exercise every day once they start an exercise program. However, this can often lead to exercise burnout and may lead to discontinuing exercise altogether. Therefore, you should set goals, which will enable you to improve your fitness level without overdoing it. Make sure that you are working out at a good intensity level for you. Find out your target heart rate range and aim for the upper end of it. Make sure you break a sweat. Also, the higher the intensity level, the more total calories you burn per minute of exercise. However, you do not want to work out so hard that you can only exercise for a short period of time. Your goal should be 3-4 times per week for 30-45 minutes of continuous aerobic activity. At first, you might need to take a few breaks but as you become more fit you will be able to exercise for longer periods of time. It's so easy to get overwhelmed at work and skip your workout. One solution is to treat your workout like a business meeting. Write it in your planner and keep the appointment. After all, you will perform better at work if you are taking care of yourself. It is very important to recognize your own barriers to exercise. Do you have trouble getting to the gym if you go home first? Do you always hit the snooze button when you plan to workout in the morning? Do you ever forget your gym clothes? 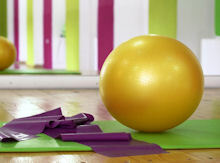 Once you identify your barriers to exercise it is imperative that you try to reduce or eliminate them. Pack your gym bag the night before or keep a few extra sets of gym clothes in your car or at work. Go straight to the gym after work if you tend to have difficulty going once at home. Try a new activity every month to avoid boredom. This will also add more variety to your fitness routine. Fitness can be a lot of fun, so think of new ways to add it to your life. Some ideas are kayaking, tennis, hiking, biking, or Family Olympics. Look on the Internet for local hiking or biking trails in your area. If you are a member at a local gym, ask them to show you how to use that piece of equipment that you have been eyeing in the gym but you are not sure how to use. 9. Do it at home. Can't make it to the gym? Well, that's no excuse! Go to the local sports store or discount store (e.g. Target or Wal-Mart) and purchase some dumbbells according to your level of fitness. Start out with a set of 3 and 5 pound weights. You should be able to purchase the weights for less than $10. 10. Enlist an exercise buddy. It always helps to exercise with a friend since you can help motivate each other on those "I don't want to exercise" days. Mitzi Dulan is a well-regarded expert in the field of sports nutrition, exercise, and wellness. She is a registered dietitian, ACSM Certified Personal Trainer, and specialist in nutritional counseling. Mitzi is in private practice in San Francisco and specializes in sports nutrition, personal fitness, and wellness. Her client list includes the San Jose Sharks hockey team. Mitzi is also the University of California, San Francisco Sports Nutritionist and the Director of Nutrition Services for The San Francisco Bay Club. She earned her dual B.S. degrees in Nutrition & Exercise Science in 1995 from Kansas State University.